Hand & Lock, Tambour Beading, Monograms, & Free Tuition! This September, Hand & Lock will be in the US, offering classes in tambour beading and in traditional monogramming in Williamsburg, Virginia, at the Williamsburg School of Needlework. Today, I’ll tell you a little bit about Hand & Lock and their classes and then, courtesy of Hand & Lock, I’ll announce a very special give-away. And I mean Very Special – once-in-a-life-time-special! 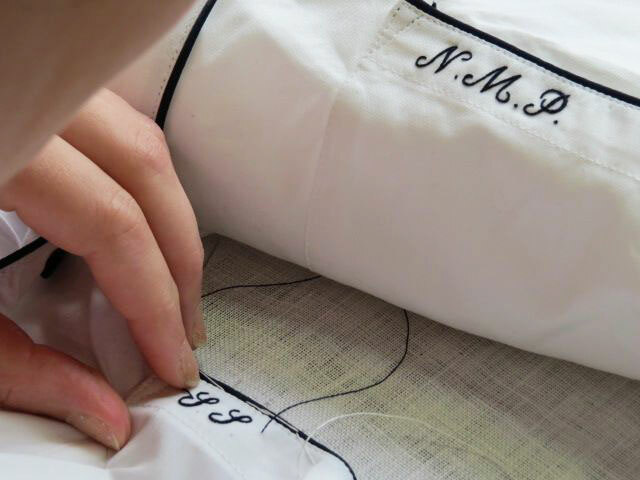 Hand & Lock is a company in the UK with 250+ years of excellence in hand embroidery behind them. They are a prestigious, world-reknowned establishment that produces hand embroidery for many of the great couture houses of Europe, for royals, dignitaries, the military, the church, and private citizens alike. Hand & Lock offers weekend and one-day workshops in the UK and sometimes, in the US. Yearly, they sponsor the Hand & Lock Prize, which celebrates fashion embroidery and is coveted by students and others wishing to break into the couture embroidery industry. This September, Hand & Lock will be offering classes in Williamsburg, Virginia. Hand & Lock is offering one Needle ‘n Thread reader a spot at the class of your choosing in Williamsburg this fall, with a value up to US$995.00. Truly, this is a once-in-a-lifetime opportunity to attend a professional class at this level, tuition paid! 1. You must be available to attend the class. If you know you won’t be available or it isn’t likely that you would be available, you should give this give-away a miss. If you know for certain that you will and can do what it takes to attend the class (get time off work, take time away from home, travel whatever distance, and so forth), then by all means, do enter! 2. The give-away covers tuition and class materials. Travel expenses, lodging, meals and all other expenses besides the spot in the class and the materials kit that comes with it are the responsibility of the winner. 3. Needle ‘n Thread is not responsible for any aspect of this give-away, beyond offering it, selecting the winner randomly, and establishing communication between the winner and Hand & Lock. Once communication is established between the winner and Hand & Lock, all responsibility on the part of Needle ‘n Thread relating to this give-away ends. 4. Entrants must follow the give-away guidelines below. 5. At the end of the give-away, the winner will be announced and contacted, to confirm intention to attend the class. If the winner decides not to attend, another winner will be drawn. 1. Leave a comment below, on today’s article on Needle ‘n Thread, by following this link. Comments sent in via email or left on any other article on Needle ‘n Thread are not eligible. 2. On the comment form, fill out the “name” line and the “email” line. The email address must be a valid address. Of the classes listed above, which one appeals to you most and why? 4. The winner will be drawn randomly on Monday, April 6th, and will be announced that day. The winner will need to contact me within a week, to accept the offer; otherwise, a new winner will be drawn. The give-away is open to US residents who have the capability of traveling to Williamsburg, VA, for the scheduled class dates and who, by entering the give-away, affirm that they have read and understood the give-away details above. Needle ‘n Thread is not affiliated with Hand & Lock. There is no remuneration for this article. I agreed to do the give-away solely because I think it offers one of you a terrific opportunity. What an amazing chance! I’d choose either the Haute Couture Intensive or Monogramming. Those look like the classes where one could learn the most. I have been looking at their Tambour Beading courses online for a long time. I would love the opportunity to attend. Fun dreaming about it, thanks for the chance. I have been working for several years to learn couture techniques and love, love, love beading, so the Haute Couture Intensive sounds like a dream come true. And the class just happens to be close to my birthday. Seems like a perfection to me. Crossing my fingers. My elderly parents live in Virginia, 20 minutes from Williamsburg, and with a thriving family of my own in Iowa, it is hard to get back East for many visits! Last year I monogrammed hand-towels (for the women) and handkerchiefs (for the men) for Christmas gifts. While they received lots of rave reviews, I know that my work could use quite a bit of polishing. I’d love to attend the monogramming course! Wow. Monogram mind or beginning tambour, likely. I have never taken any kind of embroidery class before; my skills are self taught. This sounds like such an adventure. Pick me! I would love to take the Tambour Beading Level 1 class. I have embroidered all my life and have begun beading on some of my quilts in the past few years. What a wonderful opportunity! I’d also be able to visit my brother and his family who live close by. Thanks for the chance! Hi Mary – What a great opportunity! Having been diagnosed with cancer last year, I created a short bucket list that includes taking world-class stitching classes. This is certainly one of those. I am ardent stitching – exploring many techniques, designing and combining. Currently I’m stitching a lot of dimensional embroidery with rayon threads (Brazilian), Hardanger, needlelace and stumpwork. I would definitely love to learn Tambour Beading. I also love Williamsburg. It is truly a unique historic place. The Haute Couture Intensive (Tambour Beading Levels 1 & 2 – 5 days, beginning September 21st) class interests me the most. I would be a beginner so the Tambour Beading course at Level one would be my choice. It would be such a wonderful opportunity to learn from such a prestigious company. Oh my goodness! I’d pick the Haute Couture Intensive class – it seems like one would learn the most there. I would love to take the Tambour Beading, Level One. I would love to take the Monogramming class. I think monograms are so timeless and elegant! On a recent textile study tour to Soutnern Mexico, I was introduced to a group of embroiderers who specialize in Tambour. Their work is spectacular. Inspired, I came home and started practicing on my own. I would love a chance to continue exploring different facets of Tambour. This class on Tambour beading seems really interesting. And timely. What AMAZING timing for your give-a-way! I was at the Woodlawn Needlework show in Virginia with fellow stitching buddies this weekend and we were drooling over the prospect of studying with Hand and Lock in Williamsburg next Fall! I would be all in for the Monogramming course (due to the combination of creative stitchery and practical use) — I’d love to get the opportunity to learn their special techniques and tips. Thanks!! Haute Couture: Intensive is most interesting to me because I have long wanted to learn how to do it. This would be an ideal way to begin mastering the technique as well as experiment with other applications. No doubt I would have the opportunity to pass along the skills locally. I have the luck of the Irish, which is none but today I will be dreaming of what if I won this fabulous drawing while attempting to catch up on my ironing. I have always wanted to go to Williamsburg since I was a child but to attend this class would be beyond my wildest dreams. I worked in bridal for 10 years so did my fair share of beading but just copied the stitching from other gowns as to how it should be done. I love history and have done a bit of Rennessance work including making my garb. My name is Baudy Maud since I am usually a mead wench. I did this for about five years but then I developed heat stroke issues and had to give it up. In addition I demonstrated spinning both on a wheel and drop spindle. This would totally be a dream if I won this. Everyone I know would be soooo jealous. What a stunning offer. I would love to attend the Haute Couture Intensive (Tambour Beading Levels 1 & 2 – 5 days, beginning September 21st). I would want to maximize this learning opportunity. I would love to take the monogramming class. Here in the South, absolutely everything is monogrammed! I have wanted to learn tambour embroidery for quite awhile. I would choose the haute couture class to get as much in class as I could. I love hand embroidery and the Tambor beading class would be a once in a lifetime opportunity. It is so exciting to see classes taught in the US. Thank you for the possibility of learning this skill. The monogram class, please. One of the advantages of a handcrafted gift is the opportunity to personalize it. I would love to become more skillful at this and to learn from old-school artisans. I would love to take the Tambour Beading level one class. This is a technique which is very intriguing to me, and I am excited to learn this. Oddly enough, I had just started looking at couture beading courses when this opportunity popped up! I’m really interested in the Haute Couture Intensive, which would give me both levels of the Tambour beading that I’m interested in. And with my hubby’s new job canceling our vacation plans for the year, I’ve got time to go. I would love the opportunity to learn this new skill as I am always seeking to advance my repertoire of needlework abilities. The Level 1 class would be best for me, as I have done just a minimal amount of beading. Thanks so much for the opportunity! Oh, the Tambour Beading looks just like the beading on my grandmother’s costumes that she made when in Vaudeville. Being retired, I have the time and energy to attend this once-in-a-lifetime opportunity to learn the skills and to be able to pass that tradition on to my daughter and granddaughters. I would be honored to have this chance to learn a great skill. I would love to win this trip.it has been a dream of mine to learn this wonderful technique. I just recently discovered tambour beading while trying to figure out it was done on an extant garment. I’d decided to teach myself how to do it in order to make a period style gown….immagine my incredible surprise to find you talking about this today!! I’d love to take the Haute Couture Intensive class- this is the only way I’ll be able to do that! Please pass along my thanks for the opportunity of the chance of a lifetime! How exciting! I would be more interested in the haute couture. I have been intensly interested I french couture for the last several months, especially the embroidery and beadwork. I also sew but I have not yet learned how to create couture pieces but I will! This is my dream! It is a childhood dream that was reawakened in me. I started again with my embroidery passion about 1.5 years ago and it has been fabulous. I can’t get enough and i feel like a fish who has just been place back in the water. Tambour Beasing Level one is very appealing to me. I have tried to learn the technique on my own, but would love a chance to learn the correct process from an expert. Thank you, Mary and Hand and Lock, for the opportunity. What a great opportunity for a lifetime experience. I would choose the Monogram class. Since I was a child I have been attempting to perfect this art…. I love monogramed items. It would be wonderful to attend such a course. My heart races at the chance to attend. What a truly amazing experience this would be. I would be interested in the beginning Tambour beading class. I’ve taken classes in tambour, but not tambour beading. I’d probably choose level one. And my brother is in Virginia, so I could squeeze in a family visit while I expand my needlework horizons! Thanks so much for the opportunity! I would love to attend the beginner Tambour Beading class with the Monogramming a close second. Wow- what an opportunity!! I bought a tambour hoop and needle many years ago, thinking I would teach myself the technique. However, time and life seemed to get in the way. I am still keen to learn this technique and use my “new” but old tools. I have recently become infatuated with beads and sequins and embellishment of my embroidered pieces. This would be a wonderful opportunity to learn it in a short period of time and from the masters too. Thank you for the opportunity, Mary! I would love to take the Haute Couture class. I would register for the Haute Couture: Intensive Class, so that I could complete both levels 1 and 2. I first heard of tambour embroidery from reading your blog and I found it fascinating. I took a one day beading class at Lesage in Paris in February, saw the projects the other students were working on involving tambour beading, and decided I wanted to return for two weeks at some point to take a tambour beading class. I have also looked into the class expected to be offered this summer at Lacis in Berkeley. This class in Williamsburg looks like a wonderful opportunity to learn a new technique! And today is my birthday, so I am feeling lucky! This would be an incredible opportunity and a mini vacation all in one. The Haute Couture Intensive would allow me to nail down the technique and a considerable amount of practice towards mastering the technique. Learning Tambour has been on my wish list for quite some time and the opportunity to take a course with the Royal Needlework instructors well, a wish come true! Without any hesitation I would pick Monogramming Level One! I love monograms and would enjoy the opportunity to improve my skills. Truly a very special giveaway!! I would love all of the classes offered but would choose the Monogram class because those are the techniques I would use the most. I would love to take the Tambour beading class! I have just started to incorporate beading into my stitching and this would certainly take me to the next level. There is no secret that monograms are the type of embroidery that I want to excel at. I have looked for tutoring in person and online and there is not much out there. It would be a thrill (Here that Hand and Lock) A THRILL!!!! to be able to learn hand monogramming from a prestigious school and at the Williamsburg School which I have wanted to visit. I realize that this is a random drawing so “Come on Random drawing chooser and pick me. I’ll be your best friend. I love to sew, love hand embroidery, love beading,reading about it on your site, and because my job takes up all my time, I would like to take the five-day Haute couture class to spend a week doing something that I never take time to do. so this is probably futile. I have always wanted to learn how to do tambour work. The 5-day “Haute Couture Intensive” class appeals to me because it sounds like you would have enough knowledge and skill at the end to be able to conceive and produce what you had envisioned. Both the level one classes for Tambour Beading or Monogramming would be great. Monogramming would probably prove to be more useful, but until reading this offer, I had never dreamed I could try beading. As a similar comment below, outside of my grandmother’s tutorial as a young girl, I am self taught. Just reading your news letters has been a joy and so inspirational. I have never considered taking a real class. It would be such a treat. Thank you for your website and insights. So grateful for your guidance and personal story sharing. I think that the Haute Couture Intensive course would be fabulous. A full immersion into tambour beading for a week solidifies each new lesson learned by giving time to experiment and practice with professional guidance. For me it is not just about learning an art, but it is about teaching what you have learned to others. To teach you need to know your techniques inside and out. The oppurtunity to learn with talented individuals who practice tambour beading everyday is rare. They know what works and what is less than satisfactory to get the results one is after and that is the tour de force! The beading is what I like the most. I love embellishing things. I’ve done some beading and I love to watch the design emerge with the different kinds and colors of beads! Oh Mary! What an amazing opportunity! Being new to surface embroidery of any kind I am teaching myself through your site and books that you are critiquing. And now, via this site, there is an opportunity to learn in a way that I would never imagine I would be able to do. Thank you for this chance of a lifetime Mary. I shall cross my fingers and dream about what it would be like to attend. I can’t even imagine! I would love to attend the Couture monogramming class if chosen. This would be the chance of a lifetime. I live in Williamsburg, Va. I think that it would be the most awesome way to make special gifts for everyone on your list of people. This would be terrific on American Girl doll clothes, pillows, shirts, pants, tote bags. It would open up a way to make things that were very personal for the person you gave the item with the tambour beading design worked on….it would be awesome. They all look fantastic! I really would love to take the monogram class the most. I’ve been in love with monograms since I started stitching as a little girl. Would be fantastic to have a real class! Aren’t they amazing to offer this to us?! Monogramming, Level One. I’m so excited seeing this class give away!! To be able to take a class such as this would be a dream come true. Thank you so much for offering this giveaway! Excitement fills the air!! I love the look of monograms and would love to take this class. What a wonderful opportunity! I would probably go for the Haute Couture – tambour work has always been on my “list”. I can only imagine what 5 days of such high-level instruction could teach me! And Williamsburg is one of my favorite places to visit. A winning combination! Mary, I hope YOU receive this prize. You deserve it! I am far less deserving but would absolutely love these classes, especially the Monograms class. Thanks. This is a technique I am not familiar with and it sounds wonderful! I would choose the Tambour Beading course because that sounds like it is the basics and that would be what I need to learn. Thank you Hand & Lock, and you, Mary, for creating an opportunity to do something so special. I’d love to take the Monogramming class. I have been trying to embroider an illustration, and while I picked up Susan O’Connor’s book a few years ago, it was in french (which I don’t read well at all. ;)), and I got stuck on cordonnet-ing. I’ve muddled along, but I know my work could be better, and I’d love to learn how to make it as perfect as possible. Sorry to make you squirm…*grin* Understandably though, you HAVE been quite busy with some really cool projects. Though looking at the numbers of folks who are interested in signing up for monogramming, your next book should be a big success! Good for you, I say! 🙂 I will enjoy lining up with the rest to purchase when it comes out. Thank you for this amazing offer. I have always wanted to take a professional stitching course, but going to England seems out of he question. I would choose the Haute Couture Intensive because I would learn more about framing and beading for gowns, which I often get asked about, but am intimidated to do. Even if all I do is alterations/mending for these types of gowns it would be great information. Not to mention I just want a great vacation in Williamsburg! So exciting that they will be offering these classes. I have wanted to learn Tambour Beading (level 1) for years, but have not had the opportunity to see a class offered. The “Haute Couture” class appeals to me as it includes all skill levels and then steps it up a notch. I make priestly vestments and would love to add this skill to my work. I live only a few hours away, and have access to living accommodations, as well as the freedom of travel time. I have been to Williamsburg several times and enjoyv the area. It would be wonderful to travel there for an exciting class! Here’s hoping! Oh wow, I’ve been dreaming of a world class embroidery workshop for ages. If you’re, gonna go, might as well go whole-hog, I say – if I had the chance, I’d go for the Haute Couture Intensive. I have the time, and I’d definitely get the most out of it. It is exquisite and beautiful. Surface Embroidery and beading are tow things I would like to excel.I attended a embroidery class run by Royal School of Needlework in Williamsberg, Virginia last May and enjoyed it so much. Now my kids will be in college from this September, I love to explore more oppotunity! OH MY – it is the opportunity of a life time, at least for me it would be. I have been wanting to learn Tambour, even bought the frame and tools. Since I have not done Tambour, I think the best place for me would be the Tambour Beading, Level One. Monograming & Tambour Beadwork have been an integral part of the fabric of my family history, dating back to my grandmother and greatgrandmother. As a New York City trained designer, who specializes in apparel and accessories, motifs and details are what separates my work from others. I have studied “couture embellishments” and do all my work by hand. I would very much like to have the opportunity to take my work to the next level by using “tambour beading” techniques. I view Fashion as “Art” and maintain that these time-tested and cherished techniques are an “Art Form”. Many techniques are passed onto the next generation ONLY by “hands-on” learning. I would be honored to be given the opportunity to attend Class # 3, so that I would be able to further the “Art” and “History” of the Tambour technique. It would be a privilege to be able to eventually teach and pass this exquisite “needle art” to others in order to preserve its unique creativity and beauty for prosperity. Thank you. Wow! This would be so incredibly cool! The monogramming course looks absolutely wonderful! I would love to be able to quickly and easily do monogramming on all sorts of items, and then be able to embellish from there. It would be wonderful! And to learn it from the true masters of the art? What an opportunity! And in the home of needlework in the U.S. Be still my heart. I would love to take the Tambour Beading Level 1 class ever since seeing Tambour embroidery on your blog I have wanted to learn. I’ve seen gorgeous work on Pinterest and would be thrilled to travel to Williamsburg and learn the technique. I am very interested in experiencing the Haute Couture: Intensive class, featuring Tambour beading Levels 1 & 2. It would be a wonderful opportunity to perfect my skills under the guidance of Hand and Locks’ artisan instructors. This coming year I will be making a wedding gown for my daughter. I can only imagine how beautiful the outcome will be with the adornments I will be able to create after attending theses classes. attend the beginners Tambour Beading class. It would be a dream come true. Thank you for the opportunity, amazing. i would love to attend the Tambour, level 1. I love to bead and I am learning embroidery at my local needle shop, Sandy’s x stitch in Hendersonville, NC. Right now I am learning Hardanger. Which I love. I belong to the EGA and attend the beading group, too. This would be the best of both worlds. What an amazing coincidence and chance. This year I had put both monograms and tambour beading/goldwork on my list of things to explore. I would like the Intensive in tambour beading very much although both would be a great experience. Thank you and Hand&Lock for this chance! How lovely! I took a very basic intro to Tambour class a long time ago and have been flirting with going back to it for a couple upcoming projects. As I believe in solid basics for understanding a technique I would love to do the beginning class. As it happens I will be in Virginia the week prior for another class (felting) and had planned on Williamsburg about then for my birthday on the 21st 🙂 Thank-you for considering me. What an amazing opportunity within driving distance for me. I would most definitely take the monogramming class. This is the one area I would love to learn as much as possible. This would be a dream come true for me. Keeping everything crossed for this one!! I have become very enamored with monograms as of late so that would be my choice. What an opportunity this would be to learn as much as possible on this subject. I would LOVE to learn how to monogram. I’m afraid I would be wanting to add a monogram to any and everything! I would so appreciate an opportunity to learn from the best! The Haute Couture: Intensive is the class I would love to take. It would provide the greatest learning opportunity. Thank you for doing this!! I would choose monogramming. I make quite a few monogrammed gifts and, while they are always appreciated, I feel like my technique could be much better. This would be the perfect way to move from handmade and lovely to professional looking and gorgeous! I love to embroider and the opportunity to work with a professional would be wonderful. I would like to work on the monograms class. I would like to be entered in the drawing for the Hand and Lock Tambour Beading class. I enjoy hand sewing projects, pretty thread and beads. I’d love even just to be a fly on the wall at that class, even to just see the eye-candy!!! Hi my name is John I would like to take the Tambour beading class.To make my wife crazy jealous.So she could sit and watch me and even make her crazier. Hi Mary, What an opportunity for the lucky someone! The Haute Couture Intensive appeals to me the most because I love doing couture and I’ve been taking the steps to increase my skill level. I’ve designed my great nieces bridesmaid dresses and I designed a wedding dress with alencon lace covering the bodice and applied 6000 pearls to the upper with 8 layers of tulle over the skirt. The sleeves were sheer Alencon as well. Alencon lace is nearly impossible to find now so I’d like to make my own. I love bead work on organza and silk and the photo above is gorgeous. Plus an additional bonus for me is that my son is a United States Marine and is close enough to the school that I could visit him and the date is close to his birthday as well. Thank you for offering this giveaway Mary! Although I love lettering and monograms, I am most drawn to the tambour training that is offered by Hand & Lock. The ability to work directly with speed and beading facinates me. Thus, if I were to win this wonderful opportunity, that is what I would want to study in Williamsburg. Thanks for a chance! I would love to learn how to do tambour beading. A very difficult decision, but I would choose the Haute Couture Intensive as it be the most inclusive amazing experience. To have the time, to cover all the basics and more advanced techniques at one time would be wonderful. I love to sew vintage clothes and learning tambour would be such a gift. The Haute Couture intensive class from September 21-25 is incredibly interesting to me. In the last year, I have begun to incorporate beads into my embroidery. Loving the look and feel of the beads in the finished project encourages me to apply for that spot in this awesome class! The class I would love to take is Monogramming, Level 1. I have embroidered since I was a little girl and love everything about it — it is my way of relaxing. I recently viewed some beautiful vintage hand-monogrammed white work and fell in love. It looks so elegant and chic. I want to attempt this skill one way or the other, but what an opportunity to learn from the experts. Three years ago I bought a Tambour frame and the book Tambour Work by Yusai Fukuyama. Alas, on my own I’ve not been able to figure out how to sew beads onto fabric as I would like. When I saw this offer, it seemed as though my desire to learn Tambour work with beads could be realized. I design and teach needlework and this would be a way to extend to others what I learn. I’m looking at Tambour Beading, Level One. The beading shown is obviously stunning, and as a beginner a 2-day Level One class doesn’t seem overwhelming. I would LOVE to win this. What an amazing chance. I would love, love to learn how to embroider monograms. They have always fascinated me and I look for them everywhere. I have several how to books on monogramming but getting started has been hard and then they never seem to turn out right. I would love to be able to make items for my granddaughters with their monograms. What a fantastic chance and it is one of a lifetime. Ever since we had a tambour demo session at my EGA group meeting and saw the beaded samples that the presenter made, I’ve wanted to learn the technique. I would go whole hog and take the Haute Couture Intensive class. Thanks for the chance. I’ve been fascinated by the idea of tambour beading since I read “In A Glamourous Fashion: The Golden Years of Hollywood Costume Design” at the age of 12 and saw a picture of the process in a Hollywood costume studio. 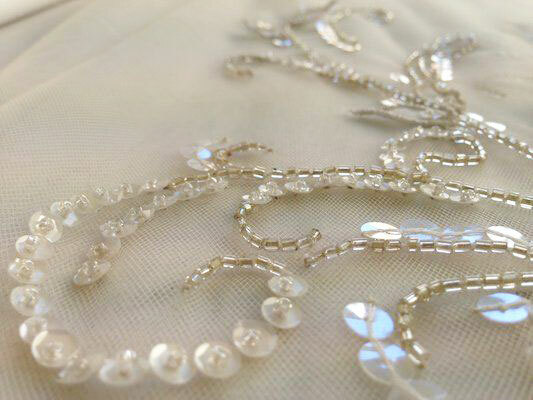 The Haute Couture Intensive appeals to me the most because it covers all of the techniques, and I want to learn tambour so I can bead my wedding dress whenever that blessed event occurs in my life! The class that appeals to me is Tambour Beading Level One. I currently do bead embroidery. I also have studied a form of raised bead embroidery under a local Native American woman. I would love to learn another technique of applying beads to fabric. So glad this is at the end of September because if I won.. I could go! While the Haute Couture Intensive is very tempting, I would most definitely choose the Monogramming. I have a love of the crispness of Monograms, the classic applications of it. I think I could improve my technique so much with a class like this. The 2-day extensive class in Haute Couture would be my dream class. I have been intrigued by Tambour beading for years and would love the opportunity to learn from the best in the world. Then I would share the experience through my Facebook page and Newsletters. Thank you for offering this special opportunity. I would love to win and attend this course! I am obsessed with tambour beading! I am intetested in the intensive haute couture beading for 5 days! I have always appreciated needlework especially museum quality work, I am amazed at the marvels that a person with inspiration can do with needle and thread. I choose level one of Tambour Beading. It is new to me, and this is an excellent opportunity to delve into it. Thank you so much for offering the give away. Wow! What a opportunity. I took a class many, many years ago on tambour work, but was to busy working to follow through. Now I’m ready to retire and spend time doing things I love. I head a group (Lace Lovers) here in PA and would love to share what I learn with them. Obviously, Haute Couture Intensive would give me the most to share. I would love the Tambour Beading, Level One class. I have yet to try this and would love to learn from an expert. What a wonderful opportunity for us. Thank you! What a fantastic opportunity! I love everything your you post. This article was amazing the beads in the monograms. Cool. All of my Sassy Stitchers just love your posts! Thank you. I would choose the Beginner Monogram class. I love how simple and yet expressive monograms can be. I would truly appreciate being able to take this class! Wow!! This is such an incredible opportunity for the lucky winner! I would absolutely LOVE to take the monogramming classes, it would be the chance to learn from the ‘Masters’. What an honor it would be to learn new techniques in a very old embroidery art form. I would LOVE LOVE LOVE to do this. P.S. Thank you Mary for opening the door for someone to have such an experience. I am very interested in the tambour class. I have tried and tried to teach myself but can’t get the hang of it, not even with your wonderful tutorial. So I would love to win this and I can get myself to Williamsburg, VA. Thank you. I have dreamt about being able to travel to England to take the many classes offered in that country. I would love to be able to take the Couture Intensive and the Monogramming classes. Thanks for the opportunity to enter the give away. This would be a dream come true. I have embroidered over the years, but my love is monograms. Not machine made, but the lovely hand embroidered ones.That would be my choice for the class…then I could add my designs to vintage ones I have so lovingly created. Unbelievable opportunity. I’ve been dreaming about learning Tambour Beading and would love to take Haute Couture Intensive workshop. It gives me a wonderful opportunity to travel and visit Williamsburg. I would love the Haute Couture Intensive Class. I have started Tambour stitching but not with beads. Hand and Lock:This is so nice of you. I have been reading your newsletter for the past 5 or 6 months. Anyone who get this class is very fortunate indeed. Best of luck to all. This has to be the most exciting give-a-way you have ever offered. I just became “semi” retired as of today and I can’t think of a better gift to give myself than the Haute Couture Intensive classes. I have often said in my next life I will go into some sort of haute couture embroidery and/or design career. This would be a real “dream come true” for me. Thank you, Mary, for all the inspiration and education you give to us! Wow! What an opportunity to enhance embroidery skills. I would pick tambour beading,level 1. The other classes are very exciting, but tambour is one technique that I have always wanted to learn and this design looks challenging. Williamsburg in the fall is wonderful and a great place to learn. As I recently discovered after years of trying other mediums that my love is free hand sewing, I would most like to attend the Haute Couture Intensive as I would love to take Tambour Beading Level one and follow it with Level two. A class junky, I learn best in live settings and would love to visit Virginia in the fall with like-minded novices. OH WOW!!! I would dearly love to attend the Level 1 Tambour Beading class. I have always enjoyed working with beads In counted cross stitch and would like to extend my skills into the beading area of Tambour embroidery. It would be something I wouldn’t be able to manage on my own, so I’m crossing fingers and toes…lol. thanks for the opportunity Mary! I’d love to take any of the classes, but the Monogramming would have to be my first choice! I would choose the Tambour Beading Level One course, as I have never done the technique before. It looks so useful for accessories and eveningwear in particular, I would love to learn to “play” with it! I would like to experience Haute Couture Intensive! I’ve looked over the class description and think it would help escalate my skills from reserved church embroidery on altar linens to awesome embellishment of priestly vestments! Pick me! Pick me! I would like to take the level one beginner class in Tambour Embroidery. I have years and years of experience in hand embroidery techniques but I have never done tambour work. Would love to learn! I would be over the moon excited to be able to attend the Haute Couture Intensive class. I consider myself a life long fiber artist., with needlework being my passion. Travel to Williamsburg would not be a problem. Oh my goodness! What an awesome drawing! I am so torn between the beading and the monogramming…although I think the tambour beading would win out! Beading because I think it’s something that I am fascinated with and yet would never be able to develop a true skill for on my own. I think I’d choose the tambour beading level one class. Thanks for doing such a fun giveaway! I would love the opportunity to attend the Beginning Tambour class or the Haute Couture. I have loved everything fiber from the time I was a young girl and had to make my own clothes. I’m retired now and spend my time creating with fiber. Thank you for offering this wonderful opportunity! What a wonderful opportunity to learn so much. I’d love to take the Haute Couture Intensive class, as that seems to be the one where you could learn the most. I must say, it was a tough choice between that and the monograming class. I firmly believe that so many of these skills are in danger of becoming obsolete, and I am so thankful that there are still places where I can learn these skills. Thank you for providing this opportunity, and I hope that whoever wins will share their impressions. Thank you so very much for giving me the chance to win this!! I have wished to take one of these courses for so long! Would love to learn the tambour beading technique and the Haute Couture!!! Thank you Mary for this opportunity. I think I would like the Haute Couture: Intensive course. If I’m going to learn how to embellish something, I would need more than a day or so to learn it. I like the idea of a “boot camp” to really get into the technique. I have been researching Tambour beading and embroidery and would like to take a beginners class and hopefully continue to the master level. I have always enjoyed the history behind of all fiber work and personally feel this should be promoted before it becomes a lost art. I read that Tambour technique gave birth to crochet. I would love to have the opportunity to attend. The Haute Couture Intensive course would add another dimension to my Brazilian embroidery skills. Anytime one learns a new skill, I think it is important to learn from the very best so as to avoid developing bad habits. The small town I live in offers nothing in the way of instruction or even supplies for needlework. This is an unparalleled opportunity to learn from the best and network with people who share my passion. Haute Couture would be my choice to learn these wonderful skills. Thank you for a chance to learn. I had the opportunity to study with Hand & Lock online through their Mastered.com classes. I learned a great deal about tambour beading and gold work. Next, I would love to learn a bit about monograming from them in person. What an amazing opportunity that would be. Plus, Williamsburg, VA is one of my favorite places. I’d welcome the excuse to travel there again. I would definitely pick the monogram class. I would love to learn to make them the correct way so they would always turn out wonderful…and I really need a trip to immerse myself in for a few days. Caregivers really need to bug-out for a bit sometimes! It would be a very special treat to spend part of my birthday month learning Monogramming, Level One, in historic Williamsburg. I would love to do this. This is so exciting. Several years ago I was able to take a class with Karen Torresi and learned so much. I came home and went right to work beading my daughter’s wedding dress. Her dress got so much attention that I have had several orders for wedding dresses and prom gowns since then. The class was not tambour beading and now that I know what this is I would love to learn how to do this for future projects. Karen does classes in UK and Australia, but I can’t make a trip like that to take from her, but I so want to learn this. My class choice would be the Haute Couture class or if not that the Beading I would be fine. I would choose the Monogramming class. I’ve been studying the classic monogram techniques for a couple of years now and would be thrilled to continue my education with this class. I really enjoy reading your blog–I’ve learn so much! I’d be very interested in the Level 1 Tambour class. Embroidery, beads, and first class instruction in a wonderful setting. I’d love to win! I would love to take the Monogramming class! Growing up in Virginia in the 1980’s, I envied all the it girls with their monogrammed oxfords, sweaters, and jewelry. I would love to learn how to embroider monograms from a pro. I’m waiting for Susan O’Connor’s Monograms book to be reissued, because it’s currently out of print. So I would be very grateful to learn this art form in the meantime. The “Haute Couture Intensive” sounds the most interesting to me. I make my own Garb for a Medieval Recreation group and Costumes for Cosplay, and Tambour beading seems like it would help me improve my technique and take my creations to the next level for both. I would love to attend the Haute Couture class. I am a longtime garment sewing enthusiast and more recently a quilter. I would love new techniques to incorporate into my sewing. I believe I would also enjoy the monograming class. I would be grateful for either. Thank you for this opportunity. Monograms are timeless and can be passed down through the generations. I would be honored to take the monogram classes. I am teaching myself monogramming. Using every source I can find even going to antique stores to examine hankies. In process of making bridal hankies for nieces and would love to learn more! I have bought some lovely hankies that I am adding shadow work and other stitches. The monogramming class would be the one I would love to take but someday I want to learn beading with the tambour needle! I would love, Love, LOVE to take the Monogramming, Level One class. I am on the pursuit learning the different techniques of monogramming. So many different techniques from different cultures in different parts of the world, and yet they all can produce incredible monograms. I want to learn, savor, and pass along the techniques from different backgrounds so they are not lost. I would love to have an opportunity to take the Haute Couture intensive. A friend of mine worked for well known fashion houses and I am in awe of some of the beading she does – I would love the opportunity to go way beyond my beading skills. I’d love to work at this all 5 days! What an amazing opportunity this would be. I love Monogramms and I have attempted to create a few, but they are far from professional looking. I have been trying to study to figure out how to make them look better and have dreamed of having a “mentor” sitting right by me and helping me along in the process. I would love to take the Monogramming class and soak up every bit of knowledge they impart. Thank you for the opportunity to enter the contest! I would love to take the Haute Couture Intensive class. While I have done both beading and embroidery, I have never used the hook shown. This would be a class of a lifetime!! Could you imagine the Renaissance gown I could make with this knowledge! I am most interested in the Monogram Class. This looks like a set of exciting and useful skills. I would be pleased to attend. I would like to take the monogram class if I win this contest. I would really like to take the Tambour Beading classes, but that would be another hobby (type of needlework), and I have too many as it is now. Monograms are something that are useful. I probably already have all the equipment needed, and I already know of a few things that I would love to monogram. How exciting this is. I love the Tambour bead work but have no experience with it. What an opportunity. I live about 45 min from the school so all the other expenses are not an issue. Thanks for offering the give away. Haute Couture: Intensive would be my choice. I have been trying to teach myself tambour beading for a few years, and I just can’t get the hang of it. I feel like I can do the chain stitch fairly well but when I try it with beads, it’s a mess. The five day class goes as far as beading on non-transparent fabrics and applying appliqués, too! I aspire to create couture beaded gowns and garments. It would be a THRILL to finally get some traction with my goal through Hand & Lock! Oh my! The Tambour Intensive! No question about it. I have the hooks, the thread, the hoop, the beads, the books… but no no one to show me in person how to do it. I have wanted to learn the technique for at least the past 3 years, but not got it right on my own. Not by my standards. If I got this chance to learn from the best in the world, I would put all my focus into it and perfect it so that I could teach it to others in Canada and the USA. I am headed for my 40th birthday this year and am so ready for a career change. Learning this and then Teaching others such an amazing skill would be a dream come true for me! I sew apparel, quilt, crochet, draw, paint and do photography as my hobbies (at a very high level of competency) in between driving a school bus: a career that for the past 6 years has given me an income as well as free time to learn everything I can and to pursue the creative side to myself. Even though I have two business degrees and business experience I do have my priorities! I chose to pursue my childhood passions, life is too short to do anything else. My current skills would truly compliment a career teaching this beautiful art. Maybe life does begin at 40!? This would be a chance to get serious with my skills and turn them into my dream career, and make a difference in the sewing world teaching even more people this unique art. This would be an opportunity of a lifetime! Thanks for giving us all a chance to win the course. Monogramming is my passion. Just recently purchased several books on monograms and want to make it my specialty in embroidery. You can’t go wrong with personalizing pieces with elegantly stitched monograms. Thank you for such a spectacular opportunity! I believe that if a person learns the basics correctly the rest will follow correctly. The Tambour beading level 1 class appeals to me the most. I love to do any type of needlework. Beading is one thing I have not tried but would love to. Beading is a beautiful way to add texture and embellishment to my needlework. Thank you for working with the Hand and Lock company to offer a once in a lifetime opportunity!! I will love to go with Tambour Beading. Because have tried it a couple of years ago and found it very interesting. I have enjoyed sewing for more than 30yrs & dove into quilting whole heartedly about 20yrs ago. Recently, I’ve been experimenting and enjoying adding embroidery & beads to my projects – using all types of fabrics (wool, silk, linen,etc) for an eclectic folk art look. Beading is what I have the least experience with – Tambour Beading Level 1 would be another great technique to add to my embellishing skills. My wish has come true! A chance to win a spot at hand & locks monogramming course just a two hour drive from my farm (that happens to be close to almost nothing of embroidery consequence). I’ve left smudge prints on my computer screen reading and wishing and hoping (and hoping and wishing – isnt there a song in there?) trying to figure out just how I was going to swing such an amazing opportunity. I have researched forever techniques and materials used in the tiny monogramming found on bespoke shirts, boxers (how decadent) and handkerchiefs. Here it is, so close but yet so far (another song? ), the chance to learn from the masters of embroiderers – the actual firm who probably, actually started the trend of tiny monogramming. Now, I cross my fingers, keep the good kharma in motion and, if necessary make a sacafrice to the embridery gods (what does one sacafrice?….) for the chance to learn from the masters and for all (well, the top few.) embrodery wishes come true. Many many many thanks for the opportunity (and many apologies for the poor grammar, even worse spelling and effusive post..my heart, hands and brain are swirling in giant embroidery hoop circles)! Haute Couture Intensive Class: It is time for a challenge in my life and this would be it. Have loved researching Tambour Beading and would love to master this technique. The Haute Couture class would be a dream come true. I have been sewing with couture methods for years now and this class would add another level to my creativity. I love the look of beads and sequins and how you can make so many amazing designs with a hook and thread. I have always wanted to learn Tambour beading. Now that my daughter has announced her engagement, I would love to be able to create a custom wedding veil for her. 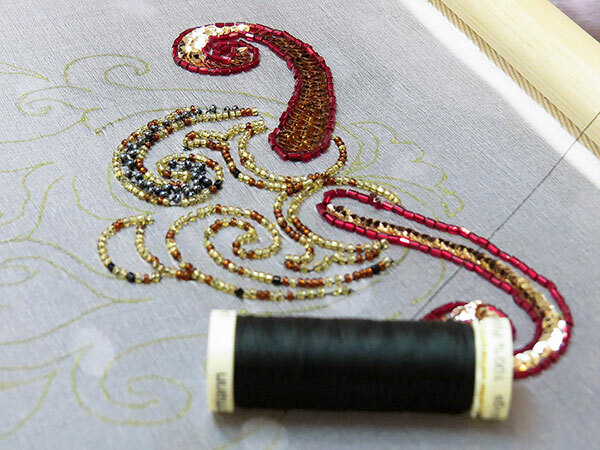 The Tambour beading class would be a dream come true! The Haute Couture intensive class appeals to me–an entire week to focus on the technique sounds wonderful. If I were to win, however, I think it would be the Level One class for me, however, as I’m not sure I have the luxury of taking a week for it this year! I’ve never tried tambour work, and the designs you can create with the beading look gorgeous. I would just love the tambour beading class. I have recently started working on a crazy quilt and this would just be a dream come true. I take classes in embroidery and needlework, regularly, but WOW! I love reading your blog and can’t wait to see the birds finished on your Secret Garden piece. Tambour embroidery has been on my “bucket list” for a very long time so if I ended up being the lucky winner, I would very much want to take the Tambour Beading Level 1 class. I would love to perfect my beading skills. The 3 day class would be perfect. Winner winner chicken dinner! I’ve just found that I may need to be changing careers–or at least I need to explore other options. As a result, the intensive tambour course really appeals to me. I would love to do this beautiful and intensive work, and I have been thinking about going to Williamsburg for a course within the next few years anyway. This would give me a start on a new and useful skill and after some practice, I might just chalk up my old job and run with it! I am SO excited for a chance to win! I am a monogram fanatic, so that would be my choice. I have been wanting to go so badly to Williamsburg (especially to see the Chase Sampler in the DeWitt Gallery) and would love, love, love to visit and be able to take the class. Thank you for this opportunity! Oh how wonderful! I’ve always wanted to learn Tambour beading. I would be interested in the Haute Couture intensive 5 day class. Last year Hand and Lock came to NYC but I wasn’t able to attend. I am most excited about the Haute Couture Intensive, I continually look at clothing and design and wonder what is required to embroider those accents on the fabric. What is the best technique? To be able to learn from an organization that has been established for so long would be a dream. The haute couture intensive tambour embroidery class would be my dream. I have long admired this type of work and the opportunity to learn at this level would be a dream come true. As you said, what a terrific opportunity. I would be interested in the Monogramming, level one class. I often embroider church paraments and linens and this course would be extremely helpful. I’m an experienced needleworker, but projects using satin stitches, trailing, and monogramming are the projects that cause me the greatest trepidation. Seeing and hearing how the professionals do it would be wonderful! As a museum professional, I’ve curated textile collections over the past 28 years, containing 18th and 19th century monogrammed items, and I’ve wondered how to demystify and achieve the technique not only to satisfy personal curiosity but also better describe and interpret it to modern audiences. I’ve pondered taking a course at the Royal School of Needlework, but the distance, cost, and inability to take time was from work has proven impossible. The opportunity to participate in the Hand & Lock workshop on monogramming here in the US offers the best and perhaps only opportunity I might have to achieve my goals while learning from the acknowledged masters of the art. The monogramming class draws my attention. Too often when I take a class, I am presented with the design already applied to the fabric and have never been introduced to the prick and pounce method of transferring designs. Starting at the beginning, with the construction of the frame and the design transfer, would give me a skill set that would carry into so much of my other surface embroidery, and learning the art of the monogram from such an expert would take my basic monogram work to an entirely new level. It’s so hard to choose, but the monogramming workshop would be amazing! The Haute Couture would be my pick. That’s a technique I’ve been longing to learn. And just looking at that gorgeous work makes my heart go pitter-patter! Thanks, Mary. What a fantastic opportunity to learn this beautiful art! I am signing up for the 5 day class in Tambour Beading. Williamsburg is a wonderful historic city with many old taverns for meals. I can’t wait to go! I have worked at Museums (Colonial Williamsburg Foundation, Jamestown/Yorktown Foundations, many historic homes,etc.) always with an interest in period needlework. I had the opportunity in 2014 to contribute to the Colonial Williamsburg Foundation’s Costume Design Center project for the wedding of Pocahontas to be held at Jamestown, Virginia. The project was her wedding jacket worked in all black work. It was quite an honor and one that we auditioned for in order to be able to participate. I would love to expand my embroidery work with the beautiful Tambour Beading (level one). It would add so much to my own historical research and my desire for quality and period authenticity. being a cancer survivor, i knew i had to live the dream. I always stole time for needlework. Now i lose myself in the creation, and design, almost every day. I purchased the tambour stand and needles with the strong desire to learn. It is still on my list. But i know i will need some help. The September class would be a dream come true. I have the supplies, thread etc to work on “Gertie”….need a little know-how push. Browsing the web site was also a treat. I would love to take the Haute Couture Intensive. I have always wanted to learn tambour embroidery. I have learned so many different techniques and would love to add this one to my skill set. What a wonderful opportunity this would be to learn from the masters. I would choose the Haute Couture Intensive. I do bead embroidery and little tambour and would love to really learn how to do tambour well. I would love to participate in the Monogramming Level 1 class. I have always thought personalized gifts are so appreciated, but have never had the time to tackle monogramming via embroidery. This would be a wonderful opportunity. What an amazing opportunity! I would love to take the Haute Couture Intensive. I love embroidery and beading so this wounds like a wonderful melding of the two. It’s been a number of years since I was last in Williamsburg and I would love an excuse to return. What a great setting for embroidery. I would love to take the Tambour beading class, level one. It would be so amazing to learn this, I would use this skill as much as possible. What a once in a lifetime opportunity! I would wish to attend the monogram class starting Sept 23rd– my birthday. I so wish to grow my sewing handwork skills. I just made my first heirloom piece. You are such a resource! I chose the thread, fabric, pattern and stitches from your archives. My daughter will have a wonderful ring pillow for her wedding next month. Monograms make a very special gift. Wow-and Williamsburg too !!! You have an excellent blog–I look forward to it everyday!! I would like to take the Haute Couture Intensive. I love sewing special occasion gowns. I also love beading and embroidery. Tambour beading would be very useful. Thanks for the opportunity. I would pick monogramming or tambour beading one. Good luck to all! What a great prize! I’m most interested in the monogramming class. Monograms are so elegant, and I struggle with them, so a technique class would be perfect! I am very interested in the monogramming class because, as the overseer of a sewing guild at a large church, I need to teach this skill to several women for the embroidery on the church linens that we make. We want to be really good at this skill. I love beading, have looked at various pieces of tambour beading but have never had the opportunity to take a class. I would love the opportunity to take the beginners class, thanks for the chance. I think taking the monogram class would be most appropriate for me. I love all forms of embroidery and have never really worked with this type. It would be fun to learn something new. I love beading on fabric and often make things that are encrusted with beads. I use a needle and thread and the process is very time consuming. Tambour work is so beautiful and looks like painting with beads. I understand the process is faster than needle and thread, once the technique is mastered. I would very much like to be able to take the level one class and start to learn this form of beading needlework, particularly from Hand & Lock, the masters in the field. Finally have my computer back!!! Woohoo. Thank you Mary for this chance at such a wonderful opportunity. I would choose the Haute Couture Intensive, I would love to learn how to add this sort of thing to my artwork pieces. I will be trying to write down in good English my thoughts and I apologize in advance for mistakes. Being born in Italy I was expose to art at a very young age. I was very lucky to always have great teachers who figured out my passion for art and they pushed me in that directions. In school we did draw, sew, paint and did a lot of arts. At home I watched my mom sewing all the time and my grandma thought me to crochet and knit when I was five. I do remember wearing a white pair of crochet gloves and a purse I made when I was seven years old. When I grew older I noticed that I did enjoy to sew or to knit or to bead while my friends were going out party. I could just seat and sew all day long. This push me to learn how to do tatting because I needed very small laces; I learn how to do white work,pulled and drawn threads for their underwear; I learn stumpwork to make tri-dimensional elements; gold work embroidery to make their clothes looking like royalty, silk shading, needle lace which I absolutely I had to learn after I found out it was originated in Venice, Italy (where I was born). Tambour work is really very new to me and I always wanted to learn this technique. I promise I will be a dedicated student. I will listed to my tutor and do my best to fulfill her expectations. I am also trained at “Le Cordon BLeu” … and I will bring delicious treats for my tutor just in case I will drive her crazy by asking too many questions. I would love the Haute Couture Intensive Tambour Beading class. I have made custom bridal dresses and headpieces, and special occasion dresses with lots of beading. Learning Tambour beading would be a great skill to add to my repertoire. I think I would choose the Haute Couture Intensive class. It sounds very comprehensive and I can only imagine how much I’d learn. This is the chance of a lifetime indeed! I would LOVE to take the Haute Couture Intensive. Although I have been taught tambour embroidery, the opportunity to solidify my skills from Handle & Lock would be worth EVERY MINUTE. I wish to expand my skills to work in fine embroidery for wedding gowns. New York City is losing many skilled artisans, and I deeply desire to continue this art! Such a Prize! I know the ‘competition-drawing’ will be fierce (as I’ve seen the opportunity posted on several Facebook articles already…)If I won I’d choose the Haute Coture Intensive. Soon I will complete an undergrad in fine art…The knowledge I gain from that training will help to design with beauty…Since I was a little girl I’ve dreamed of ‘working'(i.e. for a living) with embroidery. This training opportunity would help accomplish The Dream. What a generous offer! I think the Haute Couture Intensive would give me the skills I need to create reproduction Edwardian and 1920s gowns, and to restore antique pieces. As a cancer survivor, I’ve decided that now is the time to work seriously toward starting a business doing what I’ve always done as a hobby; this course would be the first step. What an exciting give-away opportunity! It makes me so excited that there is finally something on the east coast of the USA for needlework classes! I have to say I would love to take any and all the courses offered but if I had to narrow it down to two, it would probably be the Haute Couture intensive course or the tambour beading level 2. The intensive course is a wonderful opportunity to really excel in tambour embroidery, and to correct any faults I may have acquired by teaching myself a little. My second choice would be to take the level 2 tambour embroidery, since I did learn a little on my own and would like to push myself to do better! Thank you again for this wonderful opportunity and hope whoever does win is able to keep us updated on what they learn! Haute Couture Intensive would definitely be my first choice! I love to add beads to cross stitch, canvas work, quilting, crazy quilting, bags, etc. and have always wanted to try tambour work. I’ve even gone so far as to purchase a set of tambour hooks with handle! This would definitely be a dream come true. The Haute Couture Intensive class appeals the most to me. I would love to learn how to do tambour beading and then have an opportunity to work on a design of my choice in the classroom with an instructor available to provide assistance. Tambour work is beautiful and it would be cool to know how to do it myself. As an 18th Century reenactor I have been trying to teach myself tambour work to use in costuming as well as to entertain & educate the public. In looking for online resources, I found your article this evening–imagine my surprise! I have family in Virginia, my birthday is September 23, and I could actually attend the program if selected–it feels like fate. I would absolutely love to attend the Haute Couture Intensive–I want to learn everything I can from the best teachers available in order to keep this tradition alive and help pass it along. How generous of Hand&Lock. A huge thank you for their generous offer. I would absolutely love to learn at the 3-day Monogramming workshop. I would LOVE to take the Haute Couture classes. I have been sewing my own clothes since I was a little girl and I just love beading. It just adds that beautiful extra special detail and can set the design apart from the rest. This would be an incredible opportunity to go learn Tambour. Wow! I can’t imagine what it would be like to win one of these classes. I would like to take the monogramming class. There seems to be a revival of interest in monogrammed items–linens, towels, clothing and other personal items. It would be fantastic to be able to do your own monogramming to perfection. What a beautiful opportunity. Both the Intensive and the Monogramming interest me. The Intensive because it covers an entirely new-to-me form of embroidery (Tambour beading). On the other hand, the Monogramming appeals as an intensive three day workshop expanding on skills I have already started to develop. For now I will say, I would love either one and would have to consider my pick carefully. Wow, what a give away!!! Christmas 2013 I asked for Tambour needles and they have been calling me to try them but, alas, I haven’t responded to their call. I would be interested in the Haute Couture Intensive because it includes both the level one and two so I could learn the most possible. What an exciting opportunity! Monogramming. This would be a dream come true to actually learn my favorite type of embroidery – besides white work – from a professional. As I am self taught, I am always thinking, “This could be better.” when I am working on a project. I don’t care how many books you have or what you can learn online, having someone in person show you what to do – WOW. I inherited a set of tambour hooks, made of bicycle spokes, which my grandmother had used to do tambour embroidery. It would be an amazing opportunity to be able to learn the technique and a great tribute to her memory. I have tried using them many times but haven’t succeeded. Thanks for the give away. Which class? Haute Couture Intensive, of course. I want to live it, breathe it, and be saturated in it for 5 glorious days. What a once in a lifetime opportunity that would be. Just the thought of it gives me chills! What an awesome opportunity! I love beading but am not very good at it. I would love to attend the intensive course and learn how to do it right! What a great opportunity!!!! Thank you so much for offering. Would LOVE it! Wow! Beautiful beading- I’d love to attend the Tambour Beading Level I class! Your website is so helpful- thanks for a wonderful resource. I Love your site AND I leqrn something every time. I would love to take the five day beading class(Haute Couture) in Williamsburg. It would be wonderful! I am into different types of beading and this looks like fun. I am my guilds project chair and I could pass this on to the members that would be interested in learnng a new technique. Im very interested in Level 1 the only beading I have done is to imbellish my embroidery, would love to learn! The Haute Couture Intensive class interest me the most because it covers both beading levels one and two with more time to learn the technique and begin perfecting it. Thank you for the opportunity. I would love to take the Tambour Beading level one class. Learning new techniques is a joy and a challenge that always appeals to me. Tambour is an elegant, gorgeous form of hand work. I believe in this age of machines too many of the fine needle skills are being lost. If I were given the opportunity to attend the class I would commit to sharing my knowledge with those who are interested at no charge. What a fantastic opportunity! I would love to do the Intensive…or any of them! I love learning new skills! First, thank you for leaving thus give away open longer than you usually do. I waited until I talked to my husband about the timing. I wanted to be sure I could go. I am so excited about this opportunity, I would definitely go for the monogramming class. Monograms were traditionally used in Crazy Quilting which is my msin focus. Thanks again for all you do. My pick would be Monogramming, Level One. To learn from Hand & Lock would be an amazing experience. The description of the course is exactly what I am trying to learn properly and thank you Hand & Lock to offer someone such a great opportunity! I would love to take the Tambour Beading Level One so I can have a good foundation in this art. I am excited at the possibility of taking this course and starting to practice a new art. Thank you for considering me. I would Love, love, love to take the Haute Couture Intensive course! I learned tambour embroidery 2 years ago and have been creating pieces that way exclusively. I am making the leap of faith and leaving my part time job to pursue my passion as a career. Winning this course would get me one step closer. I would love to learn more about working with beading! Since I would be a beginner and it would be Tambour Beading Level 1. As I live in Virginia, I have followed the growth of the Williamsburg School of Needlework. What wonderful classes this school now offers, both for the professional as well as the hobbyist. The school director has done a fantastic job of bringing fine needlework to our area. I wish this school great success in their every endeavor. If chosen, I would love to learn to monogram. Thank you for all the instruction and inspiration you bring to us working alone at home. I would take the monogram course. I have been embroidering for pleasure and have been considering moving to selling monogrammed items, so this would be a great opportunity to make my pieces look more professional. Absolutely the Monogramming class. I have an idea for an installation that wouldbe a sort of large family tree with monograms of the appropriate period and initials representing branches of the family. I have had a hard time find good resource materials. This could be my launch. I would definitely take vacation time and buy a plane ticket. I’d love to take the Haute Couture class. I sew Tudor period clothing and learning how to embellish my own fabric would open so many more options for me! They are all very appealing but I think I’m most interested in the beginning tambour beading class. I love the color and sparkle of beaded embroidery. I’ve tried embroidering with beads in the past and have produced less than exceptional results. Would love a chance to take a class for free! Monogramming Level One would be my choice. I do a lot of hand embroidery, but I’ve never had any type of professional teaching. I’d love to learn from a professional to hone my techniques! I’ve been trying to incorporate beading into quilting depicting historical events. The Tambour Beading Class would be so thrilling – right now my skills are more like coloring with crayons. What a thrilling opportunity – homeer wins is going to have a class of a lifetime! im very interested in the Tambour Level One two day course starting 9/21. My daughter is getting married in a year and it would be lovely to be able to handmake something precious like this for her! Hello. I would be thrilled to be given the opportunity to take the Intensive Couture Beading course. I have been doing needlework since I was a small child. Through the years, I have taught myself most all needle techniques and would love to to take this intensive to complete my knowledge. I would use this opportunity to teach it to others in my area. Since this is a relatively lost art, I would like to be able to revive it and pass the knowledge onto the next generation of needle lovers. Thank you. I love hand embroidery.Hoping I appreciate the opportunity to win. There is so much to learn. I have family in Va too. Looking forward to see who wins. Good luck everyone!! I love hand embroidery.Hoping to learn Tambour beading. I appreciate the opportunity to win. There is so much to learn. Williamsburg is a wonderful place to hold classes of any sort! I would pick the monogram class, mostly to come up with a better looking satin stitch. (I have never done what I consider an acceptable satin stitch!) It would be such a joy to be able to get there and learn from what I feel is the “best”. I have been in love with tambour. So I would take that course. I have only seen it on line, so it must be really beautiful in person. I have the equipment to attempt it, but have not had the courage. Wow this is just an amazing opportunity. Only one class, um I want to take them all. But, Monogramming is my choice. I would absolutely love an opportunity to learn tambour beading. I had the good fortune to take a day class at Ecole Lesage in 2011, where I was given a brief introduction class and I’ve always longed for more instruction in this most interesting embroidery technique. Although I am currently living in Paramaribo, Suriname, I grew up on a farm about 3 hours away from Williamsburg, so this particular class for me would function as an opportunity to visit family as well. And, hey, I sure couldn’t pass up a chance to have some awesome Brunswick stew at Chowning’s Tavern in old Williamsburg! At the top of my embroidery “wish list” is taking a professional monogramming class. A Hand and Lock course would be fantastic! I’ve followed the Hand and Lock Prize for years. My calendar is clear for the Monogram class Sept. 23 – 25, so I’m crossing my fingers that the ‘random picker’ picks me for this great opportunity. Thanks so much for coordinating this, Mary! I would be interested in the Haute Couture Intensive. I have taken Hand and Locke classes on line but would love to continue learning in the live class setting. I have always been interested in Tambour work and Tambour beading would be and excellent opportunity to learn a new skill. That in turn could add more interest so some of my stitching pieces. What an amazing opportunity of a life time not to be missed. I am ready to pack my bags! What a fabulous opportunity! While the Haute Couture class sounds fascinating, personally I have little use for beaded ballgowns and the like. However, monogramming is a skill I would very much like to improve, inspired by the amazing monograms one sees on antique linens.